These three highly visible sites are owned by the Fairfax County Park Authority. Their location in a highly populated area ensures frequent visitation and threats from development, highway construction, and commercial interests. Site registry promotes awareness of the rich natural resources of the area, and all of them are open to the public. The main entrance to Huntley Meadows Park is located at 3701 Lockheed Blvd, several blocks off of Route 1 south of Alexandria. This is where the visitor center and path to the boardwalk and wetlands are found. The large meadows and western half of the park are accessed via a second entrance on South Kings Highway just above where it intersects with Telegraph Road. Coincidentally with the park restoration, an independent construction project to widen Telegraph Road at this corner will give the park a better parking area at this entrance when it is finished. 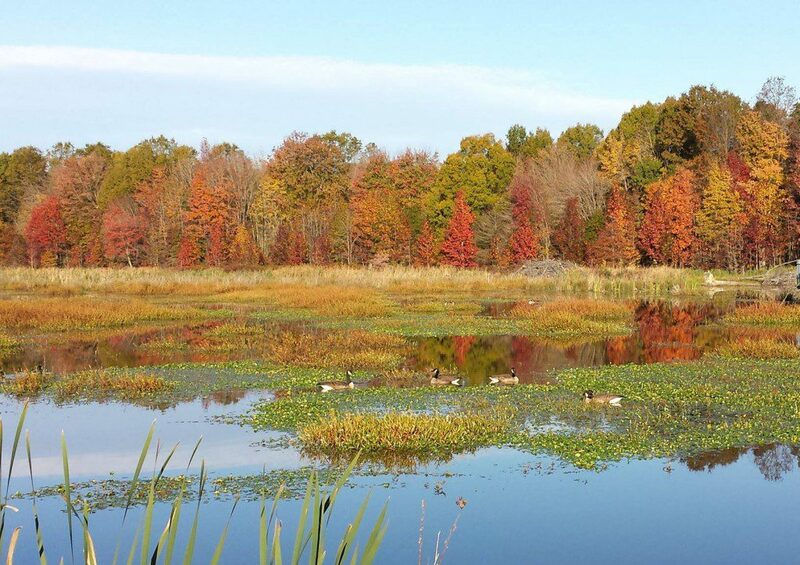 At over 1600 acres- almost two and a half square miles – Huntley Meadows is the largest of the parks managed by the Fairfax County Park Authority, and it has the largest freshwater wetland. The half mile boardwalk through the treeless central marsh is the most well-known and frequently visited part of the park. The diverse and seasonally changing native aquatic plants that grow here and the wildlife they support are obviously precious and rare in highly urbanized northern Virginia. Another special habitat, less often recognized as uncommon here, are the large meadows from which Huntley “Meadows” gets its name. Not only do open areas in many of our local parks tend to get used as ball fields, it is actually difficult for a meadow in the mid-Atlantic to remain a meadow and not turn into a forest without the intervention of some activity that interrupts this natural progression. In urban areas without farms or pastures, and where fires must be suppressed, meadows are rare. Because of the size of Huntley Meadows Park and its forest buffer, its meadows can be maintained not only by mowing, but with regular managed burns that mimic natural processes and allow wider variety of native flora to thrive. Different species will be common in these coastal plain meadows and lowland woods than in the outwardly similar piedmont meadows and woods of the more western part of our metropolitan area. The land that forms the current park hasn’t always had a boardwalk and open water, but for thousands of years it has always been a wetland. Originally a paleo-meander of the Potomac, this lowland depression rests between the long hills of the upper coastal plain that surround the Hybla Valley region of south Fairfax County. The headwaters of Little Hunting Creek are in the Park; bordering Dogue Creek is named after the Indian tribe that originally lived here. When the area became part of the large landholdings of George Mason IV and his heirs in the 1700’s, it had to be extensively drained before it could be cultivated. The remains of the long “double-ditches” used to do this can still be seen throughout the park, now overgrown and lined with large trees. Wheat, corn and oats were grown on the drained fields in the early years, and dairy farmers leased and worked some of the land as late as the 1940’s. In 1929 Henry Woodhouse reassembled a large contiguous property as he bought up fragmented plots to build a dirigible airfield. Although that plan fell through, the land was owned by the Washington Air Terminals Corporation until it was sold to the government in 1941. It was used by the Bureau of Public Roads, the U.S. Army, and the Naval Research Laboratory in turn, with each department leaving its own mark on the land. Finally, in 1975 the property was transferred to Fairfax County, and Huntley Meadows Park was established. At this point, the effects of human intervention began to taper off, but engineering enterprises continued as beavers moved in, dammed the stream, flooded out many trees, and created the current open wetland in the middle of the park. It would take a long time to list all the plant species that have been observed growing at Huntley Meadows – at this point over 600 species have been identified. The park has been fortunate in that it has had an ongoing volunteer herbarium and plant database project, established in the 1980’s, which has helped to identify and collect many of these plants over the years. Some of the showier species that the park is known for are displays of swamp rose, swamp milkweed, elderberry, silky dogwood, button bush, New York ironweed, and crimson-eyed rose mallow along the boardwalk in the spring and summer. White turtlehead, the only larval food of the Baltimore Checkerspot butterfly, blooms in shallow water in September, nearby and soon after the brilliant red cardinal flowers. In the spring the large forest sections of the park are carpeted with spring beauty, with lush green sedges and ferns filing in the wettest spots. The state rare purple milkweed flowers in several meadows in early summer. The meadows are also wonderful places to appreciate and learn about native grasses, with the tall stands of Indian grass, southeastern wild rye, little bluestem, sugarcane plumegrass, and other grasses lasting well into October. In the fall at least six different species of goldenrods bloom, alongside purple gerardia and a similar variety of thoroughworts, asters, and sunflowers. Hidden corners of the woods and less accessible wetland areas have rare gems like ragged fringed orchids and Turk’s cap lilies, although are they are elusive and not easy to find. Like all of our northern Virginia parks, Huntley Meadows faces threats from ever increasing urbanization, overuse, invasive plants, over-population of deer, and budget cuts in public funds. Unlike many smaller parks, Huntley at least has the advantage of a small but dedicated staff with responsibility for just this one park. Although it lacks sufficient resources to solve all problems, the park management is aware of issues which adversely impact the ecological health of the park. It is able to take action to counteract some of the worst threats, establishing deer management programs and limited invasive plant control measures. In addition to this, there is a long standing and active “Friends of Huntley Meadow Park” group, and scores of deeply involved volunteers — with always room for more. 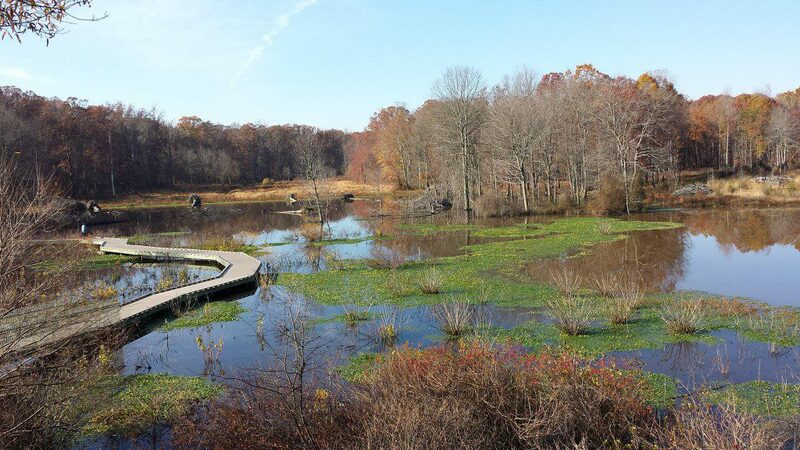 Like the human interventions necessary to protect natural areas from invasive plants and deer browse, the restoration project at Huntley Meadows was deemed necessary to preserve the freshwater wetland from the threat of silt-laden runoff from nearby housing projects and neighborhoods, and erratic water flows through the park. Although some vegetation was destroyed to complete this work, careful surveys were made to avoid sensitive areas, and over 600 plants were rescued and moved. It not so easy in Northern Virginia to find locations where the urban landscape can be totally left behind and replaced by a view of only trees, water, and natural things. This is actually possible at Huntley Meadows Park, where it is sometimes hard to believe that the city is so near when none of it can be seen, or even barely heard. It has been described as being “a natural island in a suburban sea”. The croaking frogs and calling birds change with the seasons, and the blooming plants are both the same and different each year. 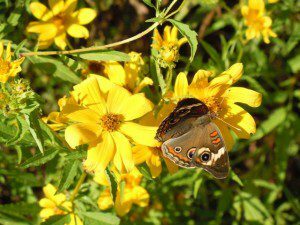 There is always something new to see, and plant lovers can also enjoy the butterflies, dragonflies, frogs, toads, lizards and other animals that thrive here. Although this year has been unusual because of construction in the wetlands, each year in this park is interesting as it continues to evolve and change as a dynamic natural system.